Over the last decade, the industrial Ethernet market underwent an intensive process of consolidation. As a result, the top five industrial Ethernet technologies now represent 93% of worldwide industrial Ethernet market share (source IMS research 2013). With more than 1.1 million POWERLINK systems installed, POWERLINK is the worldwide leader for real-time Ethernet solutions. Absolute openness, maximum performance and unmatched features are the main reasons for POWERLINK's success. POWERLINK was released in 2003 as an international standard by the independent Ethernet POWERLINK Standardization Group (EPSG). POWERLINK technology is developed based on the open IEEE 802.3 and IEC 61784-2 standards. As a testament to the protocol's openness, the technology is free of any patents. Released under the BSD license in 2008, the open source version, openPOWERLINK, is available free of charge. The EPSG decision to standardize a technology fully compliant with IEEE 802.3 is a safe choice for the future. POWERLINK will benefit from the long-term evolution of Ethernet technology without requiring further investment. POWERLINK fully supports standard TCP/IP protocols. Because TCP/IP runs on a dedicated communication channel, it ensures guaranteed bandwidth for TCP/IP without impacting hard real-time data exchange. Bringing together Ethernet, CANopen, and hard real-time capabilities, POWERLINK integrates features and advantages from three different worlds. The core of POWERLINK technology includes numerous unmatched features like redundancy, hot plugging, direct cross-traffic, multiplexing, poll response chaining, and more. POWERLINK mechanisms ensure clear diagnostics for installations. Complete overview of network traffic at any location simplifies the use of standard diagnostic tools (Wireshark, etc.). Guaranteed bandwidth for troubleshooting purposes ensures the transmission of dedicated diagnostics data without disturbing the real-time behavior. Detailed diagnostic information is available for the PLC and diagnostic tools and can be displayed in the manufacturer's standard environment. POWERLINK provides maximum performance with cycle time down to 100 µs and system synchronization below 100 ns. In addition to being able to connect up to 240 nodes in a single network, POWERLINK networks can be connected and fully synchronized to infinitely expand networking capabilities. POWERLINK demonstrates its true strength when it comes to the growing number of electronically controlled drives, which in turn are required to exchange an ever-increasing amount of data. The fact that POWERLINK has recently established a new world record in the number of synchronized drives proves it. Machines from German manufacturer Brückner Maschinenbau GmbH features the complete synchronization of 728 servo drives with a 400 µs cycle time and jitter below 1 µs. “This was possible because POWERLINK allows precise synchronization of hundreds of network nodes and simultaneously provides high data throughput. 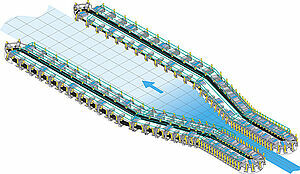 We were able to reduce the cycle time significantly — it is now only 400 µs,” explains Günter Oedl, electrical engineering manager for automation and development at Brückner Maschinenbau. POWERLINK is an industrial Ethernet solution designed to give users a single, consistent and integrated means for handling all communication tasks in modern automation. It is generally suitable for all conceivable applications in machine and plant engineering as well as for process industry applications. 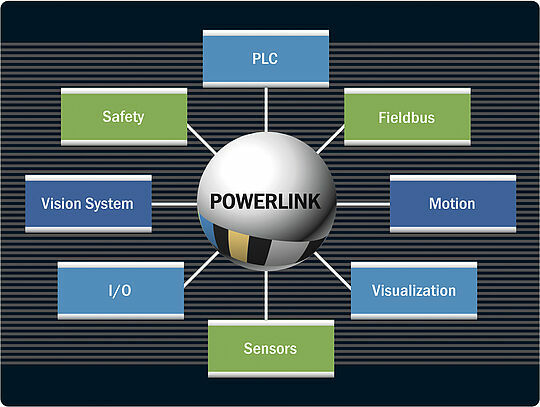 A POWERLINK network integrates all components in industrial automation, such as PLCs, sensors, I/O modules, motion controllers, safety controls, safety sensors and actuators, and HMI systems. A POWERLINK cycle not only accommodates transmissions of actual payload data for applications, but also provides a fixed time slot reserved for transfers of miscellaneous user data in its asynchronous phase. As a result, data that is not time-critical can also be transmitted, e.g. service data, to enable the remote maintenance and configuration of a device. Likewise, devices that do not belong to the immediate automation level can be included in the network environment as well, e.g. in the case of video cameras for site surveillance and access control. Moreover, a proper gateway also allows for the transmission of other, non-POWERLINK fieldbus data within the asynchronous part of a cycle, i.e. the protocol enables the integration of various types of networks.